Don’t worry…no movie quizzes, Scrabble games or pokes in the bunch. Instead, Linked in has partnered with well-known companies with business-ready productivity applications to provide apps that users can plug-in to their profile and display on their LinkedIn homepage. Remember OpenSocial, Google’s initiative to build common APIs for developing social web applications? LinkedIn came to the party and this is the result of that effort. Until now, when you visited a LinkedIn profile you saw only basic information such as employment history and recommendations. With the new platform, you can show your profile visitors all the fine literature and business books you’re reading thanks to the Amazon app; upcoming trips on the Tripit app; your latest blog posts with the WordPress or TypePad app; or share files with the Box.net app. Google’s in the game with an app that lets you show off a PowerPoint presentation. Don’t describe what you do for a living, show ’em. SlideShare has a similar app. Check out the complete list of initial InApps here. 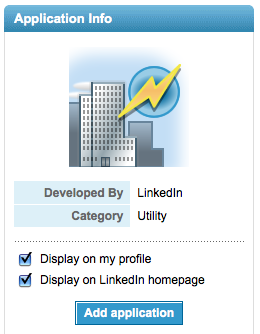 It will remain to be seen if this is truly a game-changer for LinkedIn. Are you interested in adding apps to your profile? I like the Apps, but I don’t want my ReadingList displayed so prominently at the top of my LinkedIn page. Has anyone discovered a way to move these Apps around? Thanks for pointing to this useful resource – something I always wanted to have. I specially liked the WordPress Inapp – very useful.